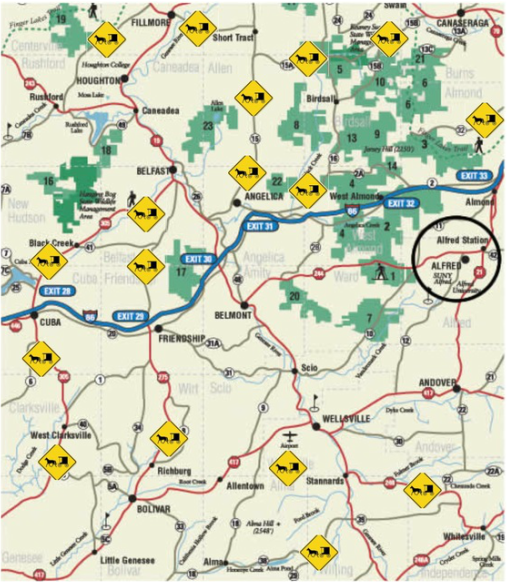 Sharing the Roads in Amish Country - Ardent Solutions, Inc. Rural roads are often narrower or may vary in width more than city streets. A narrow road give you less room to maneuver and can be especially dangerous when passing horse-drawn vehicles. A loose gravel or grass berm area can also be hazardous. Open ditches along rural roads are often deep and close to the road. Seemingly open roadways may have sharp dips or unexpected turns. In cold weather, a road shaded by trees or buildings may be icy because then sun has not shone on that part of the roadway. Blind corners created by wooded areas, corn fields or other tall crops are also hazardous. Knowing "closure time" is a safety factor that could save lives. "Closure time" is the time a driver has to recognize and respond when coming upon other vehicles. Slow moving vehicles, including horse-drawn buggies and farm equipment, fall into this category. Because it may be difficult for motorized vehicle drivers to judge the speed at which they will close in on the horse-drawn buggy, drivers should slow down immediately if you see a horse-drawn buggy ahead. When stopped at a stop sign or light, remember to stay back since buggies often roll back a few feet after coming to a complete stop. An easy way to measure the distance is to stop your vehicle far enough back so that you can see where the rear wheels of the buggy touch the road. If you have a larger vehicle, like an SUV or van, allow more of a cushion. Passing should be done only when it is safe and legal to do so in a passing zone. Never pass on a hill or curve where oncoming traffic may put everyone at-risk; including the buggy occupants. Allow ample room to pass. Be aware of your surroundings and road conditions. Loose rocks, fog, gravel, snow, wet pavement, and dirt may make passing hazardous. Be patient. Gunning your vehicle, passing too closely or beeping your horn may spook the horse and cause it to swerve into your lane. Be watchful of vehicles behind you that may also try to pass. Do not assume that the horse-drawn buggy operator can see you. 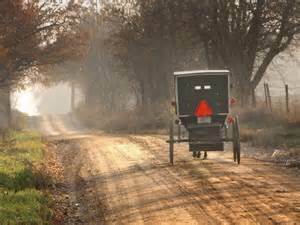 Be cautious of potential left-hand turns that could put the horse-drawn buggy directly in your path of travel.